On my coach for a tour of Valencia on our Cosmos tour, October 15, 2012. The National Ceramics Museum Gonzalez Marti is housed in a palace that dates from the 15th century and was refurbished in 1740 on rococo style with a magnificent alabaster entrance. Inside, you can find the 18th century carriages, the 19th century rooms, medieval ceramics and an important collection of tiles made in the Royal Ceramics Factory in Alcora. 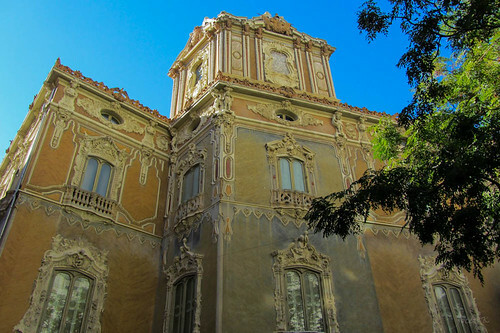 Its present aspect is the result of a Rococo conversion carried out in XVIII century on the house belonging to the Rabassa de Perellós, title-holders of the marquisate of Dos Aguas. The main door is on one side of the house and is crowned by a statue of the Virgin Mary, from which two streams of plentiful water flow, symbolizing the Júcar and the Turia rivers. In the 19th century were lost the Rovira Frescos and French-style balconies with undulating railings were installed. The Gonzalez Martí National Museum of Ceramics and Sumptuary Arts contains an important collection of ceramics, with prehistoric, Roman, Greek and Arab items. There are also plenty of contemporary works, including some by Picasso. The museum's collection also includes a representative selection of traditional ceramics from towns such as Manises, Paterna and Alcora.